Form : Shinogi-zukuri. Iori-mune. Both mihaba and kasane are oridinal. Moderate sori attached. Chû-kissaki form. Nakago : Ubu. Yasurimes are suji-kai. Saki is kuri-jiri. One hole. Jigane : Itame-hada loosened. A little hada-tatsu appearance. It is tinged with black colour. Jinie attached. Jifu mixed. Hamon : Chû-suguha. It runs in shallow but grand notare. Ko-ashis and suangashis appeared. Nie attached well. Boushi : It runs in sugu, then turns in komaru. Saki has a little haki-kake. [ Highlight ] First generation Yamashiro-no-kami Kunikiyo was a child of third generation SHIMADA Sukemune. His native place was Matsumoto, Shinshû province. He was called Kichiemon Sukemune. He entered Horikawa Kunihiro school in Kyoto. Then, he changed his name Kunikiyo. After decease o fhis teacher Kunihiro, he backed to Shinshû for a while. Then, he went through Echigo-Takada, later, he was emploied by Matsudaira family of Echizen provincein Kanei1, lived in Fukui. In Kanei 4, it was said that same timing as Yamashiro-no-kami was conferred on him, he was allowed to sign Kiku-mon "菊紋". Second generation Kunikiyo, who worked actively around Kanbun, was second son of first generation Kunikiyo. The name was succeeded, third generation around Ten-na, fourth generation around Kyôhô. 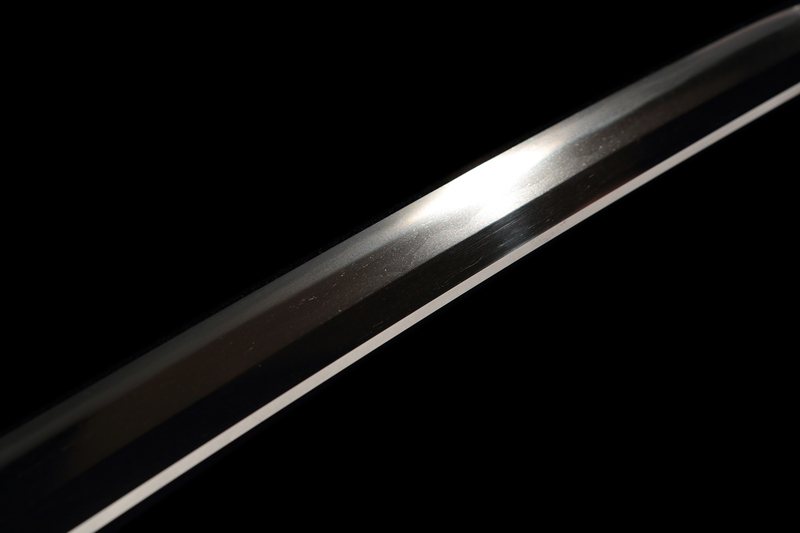 The swords which created by second generation Kunikiyo later on, many of them had character ichi "一" below Kiku-mon "菊紋". This is seldom seen on first generation's swords. The sword is an impressive, which itame-hada loosened, a little hada-tatsu appearance and tinged to blackened jigane. [ Conditions ] It is in furu-togi (some times past since last polishment), but it can be preserved and appreciated as it is. [ Attachments ] Habaki (suaka-ji, silver foiled, single), shirasaya, bag of shirasaya and NBTHK Hozon paper (issued on 31st August Heisei 18(2006)).